How many teaspoons of sugar do you consume a day? Amanda Tiffen went from 30 teaspoons of sugar per day (unknowingly) to 6 teaspoons of sugar per day and in doing so lost an astonishing 20 KG. After years of dieting and fighting to control her weight, Amanda easily went from a size 16 to a size 8 in 9 months. A LIFE LESS SUGAR is the inspiring story of how an ordinary and busy working mum used information from a documentary she had seen on TV and turned that information into her reality. She lost 20KG by reducing her sugar consumption, teaspoon by teaspoon, and then wrote a runaway bestseller about how she did it. Enlisting the help of good friend Leigh Brown who is an amazing cook (something Amanda is not!) to create some low sugar, low carbohydrate delicious dishes. The recipes are easy to follow with nothing complicated. Part memoir, part diet and recipe book A LIFE LESS SUGAR will help you to reduce the high sugar content in some of the most common foods that Amanda found in her (and maybe your) pantry. 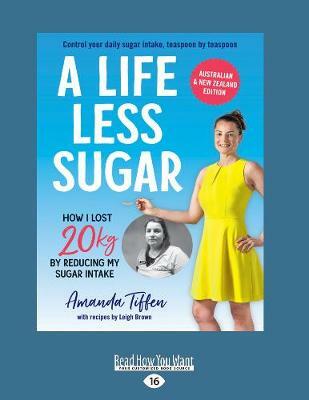 Buy A Life Less Sugar by Amanda Tiffen from Australia's Online Independent Bookstore, Boomerang Books.